Next week is the final few days of the Eat Local Challenge and it’s always good to end on a sweet note. 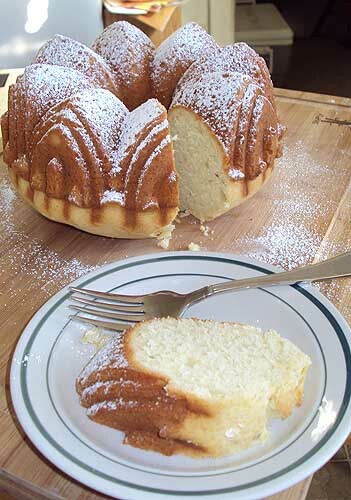 Despite the fact that sugar is not produced anywhere near here, you can still make an amazingly tasty cake using local flour from Grass Valley Grains and olive oil from several local producers. Chaffin Family Orchards provided the oil for this particular recipe, but Apollo Olive Oil and Calolea Olive Oil are two others that are well-worth exploring. Olive oil cake has a long and proud tradition in the Mediterranean, where they have been using olive oil in place of butter for centuries. The trick for a dessert like this is to use the very best extra-virgin olive oil you can afford. Extra virgin olive oil is pricy because it’s used mostly as a flavoring in dressings and as a last touch for other dishes. It’s really not meant to be used for sautéing over heat. A later pressed oil can be substituted, but the flavor will be much more mild. I wouldn’t call this recipe healthy – it is still cake – but because there’s no butter fat, it’s slightly better for you than a traditional cake recipe. Because of the number of eggs involved, this cake will also stay moist for much longer time, so feel free to make it a day or two ahead. Or freeze it for even later. As with all baking, make sure the ingredients are at room temperature before starting – specifically the eggs. The first step is to cream the eggs and sugar together and cold eggs don’t cream well. When the mixture is smooth and no longer grainy, then it’s time to proceed to the next step. The one ingredient you should not skip, even though it may seem like a hassle is the lemon zest. Zesting a lemon isn’t hard: use a rasp or microphone grater and grate the yellow bit off the outside of a lemon. For a variation, substitute an equal amount of orange peel. But wait until oranges are in season first. I made this cake in a bunt pan just because I like the pan and don’t get to use it very often. It will work just as well in a regular square or round cake pan. Because the flavor of the oil is so distinctive, I think that all this cake needs to finish it is a dusting of powder sugar or a little whipped cream. A heavier frosting would overwhelm everything. Once the cake is baked, let it cool thoroughly before removing from the pan. As the cake cools, it pulls back slightly from the sides of the pan, giving you a much more successful cake-flipping experience. Serve with lemonade or a glass of iced coffee. 1. Preheat oven to 325°. Grease an 11-cup bunt pan with butter, then dust with 2 tbsp. of the flour, tapping out excess. Set prepared pan aside. 3. Spoon batter into bundt pan and smooth out top with the back of the spoon. Bake until cake is deep golden brown and a wooden skewer inserted in center comes out clean, about 40 minutes. Transfer cake to a wire rack to let cool completely, in its pan. 4. Dust with powdered sugar before serving.